involves the organization, preservation, conservation, and restoration of documents and works of art, with particular attention given to ensuring the safekeeping and public availability of archival documents and the preservation and safekeeping of works of art. The Dedalus Foundation’s activities in this domain include the organization, preservation, and care of its own archives relating to the life and work of Robert Motherwell, along with documents related to the history and activities of the Dedalus Foundation. 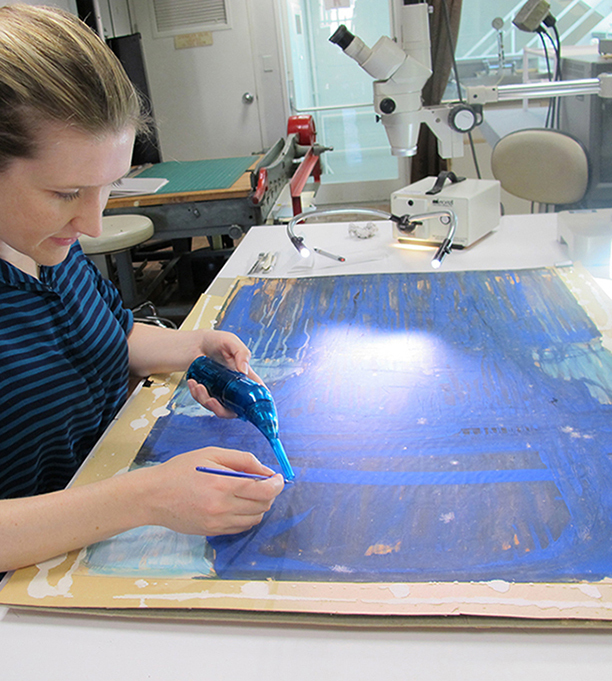 The Foundation also supports archival work and oral histories in collaboration with various museums and educational institutions, such as The Museum of Modern Art, where it sponsors a Dedalus Fellow in the museum’s Archives; the Conservation Center of the Institute of Fine Arts, where it sponsors a Dedalus Fellow in the conservation of modern and contemporary art; and various programs of the Archives of American Art. The Foundation is currently conducting an oral history project centered on Robert Motherwell and his colleagues, and is sponsoring a project involving oral histories related to emerging artists. In recent years, the Foundation has also sponsored symposiums and conferences on oral history in conjunction with The Museum of Modern Art Archives and the Columbia University Program in Oral History.